This trip provides a unique adventure in one of the most amazing fjords in the world. Run by experienced local guides with excellent knowledge about nature and the geography of this incredible region you will enjoy an unbelievable experience that will bring you closer to nature, leaving only ripples on the water and everlasting memories of the internationally renowned UNESCO-listed Nærøyfjord. Situated in south-western Norway, the Sognefjord and Nærøyfjord, are part of the West Norwegian fjord landscape stretching from Stavanger in the south to Andalsnes, 500km to the north-east. The two fjords - among the world’s longest and deepest - are considered as archetypical fjord landscapes and are among the most scenically outstanding fjord areas on the planet. Their exceptional natural beauty is derived from their narrow and steep-sided crystalline rock walls that rise up to 1500m from the Norwegian Sea and extend 500m below sea level. The sheer walls of the fjords have numerous waterfalls while free-flowing rivers cross their deciduous and coniferous forests to glacial lakes and rugged mountains. The landscape features a range of supporting natural phenomena, both terrestrial and marine and several locations in the area are listed as World Heritage Sites. TO VIEW THE ROUTE YOU WILL TAKE ALONG THE FJORD CLICK HERE! Our trip begins paddling from Flåm along the Aurlandsfjord before completing the full length of the UNESCO-listed Nærøyfjord passing through the landscape that has been carved out by glaciers with cascading waterfalls plummeting down from the mountains around the fjord. On day two we have a choice to take a hike to Beitelen, a viewpoint at 980m above sea level or Stigen, a mountain farm. Both will give a chance to take in the spectacular view of how the fjords have been formed by nature itself. Throughout this trip the dramatic scenery will give you a unique experience of glacial power as you witness the deep and prominent cuts it makes through the mountains. On the way we are certain to spot some of otter, eagle, fjord porpoise and seal (hopefully all of them!) and as we paddle with a fishing line trailing behind us you may also be lucky and catch yourself some fresh fish for dinner! 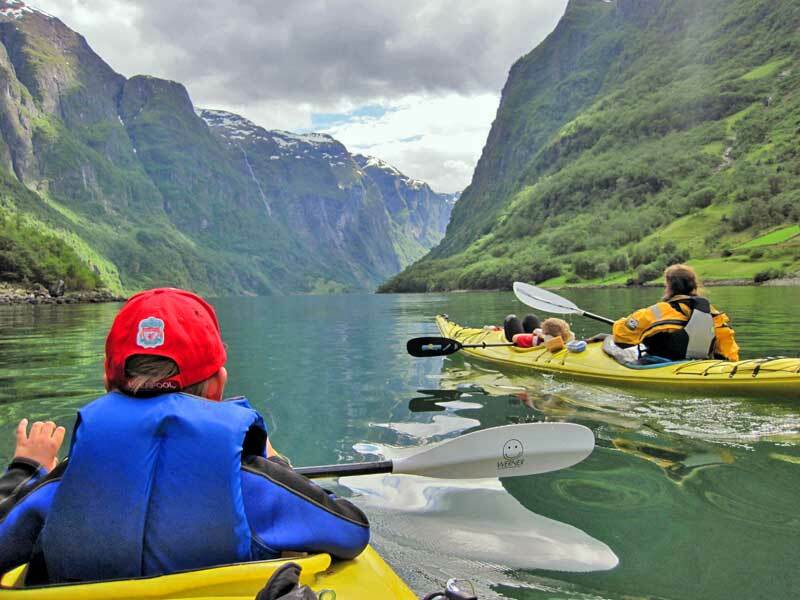 An experienced kayak and mountain guide will lead you on your way through the fjords and on the mountain, as well as through the history of the area. We provide the kayaks and all necessary camping equipment, as well as the food throughout the trip and so all you need to bring is warm clothes, waterproofs, a sleeping bag, sleeping mat hiking boots and a backpack. The Nærøyfjord is one of the narrowest fjords in Europe. Surrounded by towering mountains up to 1700 metres high, this arm of the Sognefjord is amazingly beautiful. The small picturesque village of Flåm, is situated in the Aurlandsfjord, an arm of the 204km long and up to 1308m deep Sognefjord and is the end station of the popular Flåm Railway. The Flåm Railway is one of the world’s steepest railway lines on normal gauge and its twisting tunnels that spiral in and out of the mountain bear witness to the most daring and skilled engineering in Norwegian railway history. The Flåm Railway is one of Norway's major and most spectacular tourist attractions and the train journey between Bergen and Flåm provides travellers with some of the wildest and most magnificent scenery in Norway. On the 20km (1 hour) long train ride, you can see rivers that cut through deep ravines, waterfalls cascading down the side of steep, snow-capped mountains and mountain farms clinging dizzily to sheer slopes. Along the route, the Flåm Railway also makes a short photo stop at the beautiful Kjosfossen waterfall. Flåm has a population of around 400 inhabitants. In 1980 most of the locals were farmers; today most of the people work in the tourism industry or on the railway. Flåm is one of the most popular cruise harbours in Norway. The origins of its flourishing tourism trade date back to the late 1800s, when large numbers of English tourists or "salmon lords", came to fish in the Flåm river. These travellers laid the foundation for hotels to be established and encouraged a steady stream of tourists who have continued to come up to the present day. Bergen has given a warm welcome to its visitors for more than 900 years. A city with its feet in the sea, its head in the skies and its heart in the right place - Bergen is Norway's second largest city with a population of roughly 250,000. King Olav Kyrre founded the city of Bergen in 1070, and it was the country's capital from 1110 until 1299. Bergen has been a great centre of trade throughout the ages. Fish was exported from Bergen, while grain was the chief import. Bergen is called ‘the city between seven mountains’ because of the many mountains that surround it. At 624m high, Mount Ulriken is the tallest of them. Bergen is also a European City of Culture and its many museums and art galleries are well worth a visit at the end of your trip. Fly to Bergen and travel by train to Myrdal for onward rail connection to Flåm, check into the Nærøyfjord Youth Hostel followed by early evening briefing about your trip and prepare equipment ready for the next day. Our trip starts at 9.30am on the beach at Flåm where we get all equipment ready and packed. After a safety & rescue course we set out along the Aurlandsfjord past the village Undredal, overnight camping. We continue kayaking with optional hike to Beitelen, a viewpoint 980m above sea level or alternatively, we visit a mountain farm. Both locations provide superb views and we will camp overnight. Our final day on the water finishes in Gudvangen at 5.00pm and after loading up the kayaks and our gear we transfer by road back to Flåm and overnight stop at the Youth Hostel. Today you will head back to Bergen and there are two options: a) Catch the 6.00am boat from Flåm to Bergen arriving around noon or b) Return by train on the Flåm Railway. Sightseeing day in Bergen, departing Bergen Airport late afternoon/early evening back to the UK. To make the most of this unique experience don't forget to come along with a big smile and a positive attitude! However, you will need to pack light as all of your trip gear will need to fit inside a small kayak; and the rest of your personal equipment can be left at our base for collection at the end of the trip. This trip is based on group size of 4-8 persons. Minimum age for children is 11 years old. It is also possible to arrange night time accommodation in cabins or inns as an alternative to camping; however, this will incur an additional cost. You can also upgrade to cabin accommodation at the Flåm Youth Hostel. After arriving into Bergen from the UK you will need to get to the village of Flåm which is where our trips begin and where you will pick up your kayaks and equipment. The best way to get to our kayaking base in Flåm is to fly to Bergen and travel by rail from Bergen to Flåm returning back to Bergen at the end of your trip by either boat or train. Our itinerary is designed so you can have a relaxing first day and enjoy the spectacular train journey to Flåm before starting out on the fjord's the next day. This trip is suitable for beginners and provides a spectacular introduction to kayaking in one of the most beautiful locations in the world. It is ideally suited for adults and active families with children who are aged 11 years or older.